This morning, Google posted a new update to the data anomalies page for the Search Analytics report in the Google Search Console. In short, the search Analytics report has not yet updated since August 31, 2016 and Google is aware of it. 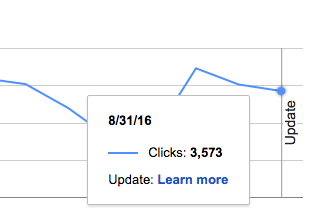 Google wrote "a system error began dropping all Search Analytics data after Aug 31. We hope to fix the problem soon and add back the missing data." Now, many are going to believe that the "update" line in the report has something to do with the September 2nd Google update but it is unrelated. The update line simple means there is a data but with the Google Search Console report and Google has a link that takes you to the specific issue. Again, the two are unrelated and also unfortunate, as many cannot currently tell if the Search Analytics report can show if they were hit in a good or bad way by this September 2nd update. Hopefully Google will be able to retrieve the old data and backfill it soon.